Microwave caramels and water in large glass microwaveable measuring cup on HIGH 2 to 2-1/2 min. or until caramels are melted and sauce is smooth when stirred; cool slightly. Refrigerate 1 hour or until caramel is firm. Try one of these creative toppings to "load" your caramel apples: Chocolate-Pecan Caramel Apples , S'more Caramel Apples and Peanut Butter-Swirl Caramel Apples. 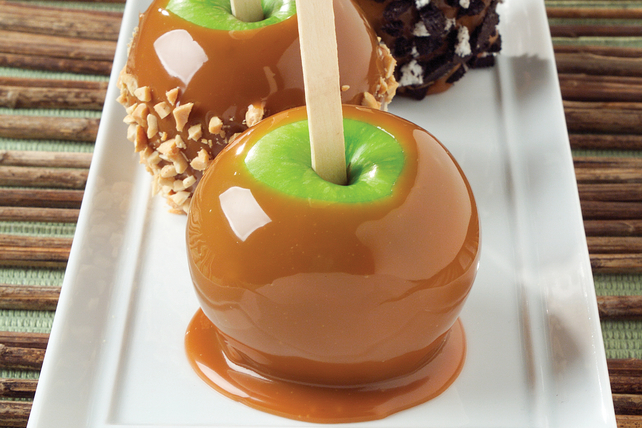 With their built-in portion control, these caramel apples make a great treat. Each 269-g bag of Kraft Caramels contains about 35 caramels. Wash and dry the apples thoroughly so that the caramel sticks to the apples. Remove apples from refrigerator 15 min. before serving; let stand at room temperature to soften slightly. Coarsely chop 1 cup pecans. Melt 2 oz. Baker's White Chocolate with 1 oz. Baker's Semi-Sweet Chocolate as directed on package; mix well. Drizzle over apples. Press nuts into chocolate. Coarsely chop 5 graham wafers. Melt 2 oz. Baker's White Chocolate with 1 oz. Baker's Semi-Sweet Chocolate as directed on package; mix well. Add to 2 cups Jet-Puffed Miniature Marshmallows in microwaveable bowl; toss to evenly coat. Microwave on HIGH 15 to 20 sec. or just until marshmallows start to puff. Swirl gently with spoon to marbleize. Immediately spread onto apples. Carefully press graham pieces into marshmallow mixture. Melt 3 oz. Baker's White Chocolate as directed on package; mix with 2 Tbsp. Kraft Smooth Peanut Butter until blended. Drizzle over apples.